The Canadian population is made up of 13 subpopulations distributed among 13 management units. More than 60% of Canada’s Polar Bear subpopulations (eight management units) are stable or increasing while 20% (two management units) are likely declining. Trends for the remaining 20% located in 3 management units are not known due to lack of data. 4 Population estimates help ensure that management and conservation actions are appropriate. Around 600 or 3% of the Canadian Polar Bear population are killed in Canada annually under a limited hunt, mostly by native Inuit hunters. 6 Quotas are established for each management unit designed to keep harvests at levels the bear population can sustain. Hunting is prohibited in units experiencing or threatened with population declines. For now, some populations may still be safely hunted. In Manitoba, Polar Bears have been protected under the provincial Endangered Species Act as of 2008, and hunting or trapping of bears is not permitted. In Ontario, the Polar Bear has been protected under the province’s Endangered Species Act since 2009. Only First Nations hunters residing along the Hudson Bay and James Bay coast can harvest Polar Bears. There is a permissible limit of no more than 30 bears per year. In Québec, the Polar Bear has been listed as Vulnérable under the Loi sur les Espèces Menacées ou Vulnérable since 2009. The James Bay and Northern Québec Agreement (1975) restricts the taking of Polar Bears to Aboriginal peoples and ensures that they have exclusive access to a Guaranteed Harvest Level of a maximum of 62 bears per year, or less, dependent on sustainable use estimates. In Newfoundland and Labrador, the Polar Bear has been listed as Vulnerable under the Endangered Species Act since 2002. Labrador Inuit having exclusive rights to harvest 6 bears/year (males and females without cubs) under a quota system along the Labrador coast. In the Northwest Territories, the Polar Bear was listed as a species of Special Concern in 2014 and a management plan is currently in development. Polar bears are listed as a threatened species under the US Endangered Species Act and the import of polar bear parts into the U.S. is prohibited. Climate change: Environmental change is the most critical long-term threat to Polar Bears and their habitat. Polar Bears depend on the sea-ice surface to catch their seal prey, and global warming means progressively less sea ice on which they can hunt. Changes in sea ice are not expected to affect Polar Bears in all portions of their range at the same time, or in the same ways. Polar Bears in some portions of their range may see transient but significant benefit from a milder climate. Harvest in excess of established quotas: In cases where there are concerns regarding the sustainability of harvest levels, coordinated management actions by jurisdictions and their partners, including the adjustment of quotas for each management unit, should reduce or remove the threat of unsustainable harvest. 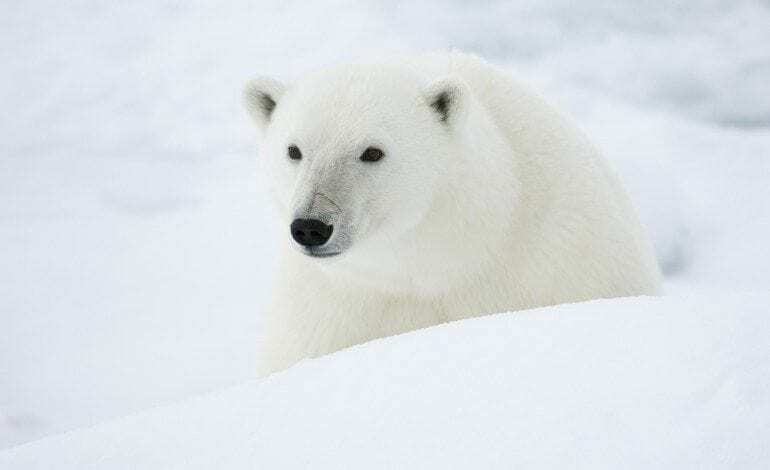 Canada currently invests approximately $1.7M/year into monitoring its Polar Bear population to ensure that quota determinations are based on recent data. Contaminants: As a top predator, Polar Bears are exposed to environmental contaminants that have effects at the individual, and possibly, at the population level. Resource industry activities: Exploration and development for resource extraction (e.g., metals, minerals, oil and gas) has the potential for direct mortality and disturbance of bears, including habitat alteration and disturbance of bears in maternity dens.